Our Under The Stars summer camp features all of kids’ favorite activities such as our huge indoor trampoline, multi-sport court, gaga ball pit, and face-off climbing wall. Our indoor facilities include our bright classrooms and dance studios for indoor games and crafts. Outdoor activities include basketball, beach volleyball, the playground, field games, and swimming in our aquatics complex complete with waterslides! No other camp in the area offers this combination of fun and physical activities. Your kids will have a BLAST! Trampoline: The Launch Pad is one of our newest additions to The Arena Club. Campers of all ages will enjoy a 16-pad jumping surface with angled walls to jump, bounce, or play dodgeball in! Gaga Ball: Gaga is one of the hottest new games for kids and is a fast paced, high energy sport. As a gentler version of dodgeball, the game is played with a soft foam ball and combines the skills of dodging, striking, running, and jumping, while trying to hit opponents with a ball below the knees. Multi-Sport Court: Kids will enjoy a variety of group games and activities on our new multi-sport court. Kids can play basketball, volleyball, dodgeball, or good old-fashioned camp games on our cushioned sport court floor. Water Park: The Arena Club’s state-of-the-art year-round aquatics complex is the perfect place for your child to splash! 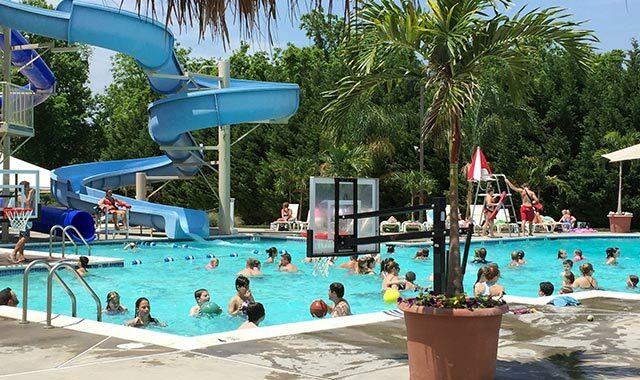 Our younger campers will enjoy cooling off in our beach pool, and older campers love our recreational pool with two waterslides, a diving board, and aqua basketball. We guarantee that our “Under the Stars” summer camp is like none other in the area. We are a Maryland State Licensed day camp that has top notch counselors caring for your child every day. Our entire team is fingerprinted, background checked, and First Aid and CPR. certified. All of our lead counselors have a teaching background, are majoring in childhood education, or have at least three years of instructional experience with children. Campers are required to pack a lunch each day. We also have snack time every day, so be sure to pack a snack in addition to their regular lunch. If your child will be attending extended care, please be sure to pack an afternoon snack and drink as well. Water will be provided throughout the entire day to ensure all campers are well hydrated. My children have attended the camps offered at the Arena Club for 3 summers. My children describe the camps as "fun and cool". They have established great friendships amongst other campers and my oldest daughter is influenced in positive ways by the excellent camp counselors. As the parent I have been impressed by the professionalism, excellent follow through and follow up by the camp staff, which reinforced that I selected the best camp in Harford County! I want to let you that we have been so completely satisfied and impressed with everything this summer. You and your staff are amazing. We don't have any complaints, it was truly wonderful experience with amazing people. The counselors all seemed to enjoy it and treated the kids like friends/family! Thank you!